No this isn't some sort of gamer's miracle. 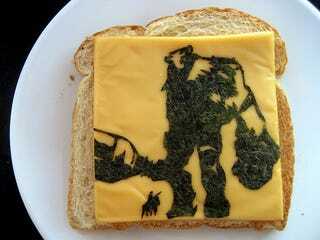 Someone didn't pop a piece of cheese on bread, toast it and discover this image from Shadow of the Colossus seared into their lunch. This was the work of human hands. Human hands and a bunch of seaweed. Hey, if you're taking requests how bout one of team Kotaku ala Last Supper, but made with Promite on buttered bread.